Pro-GH formula helps replenish your body’s cells and stimulate the secretion of HGH, which provides energy and maintains youthfulness. Pro-GH is a powder that contains natural ingredients, that may improve immune function, provide energy, and build muscle mass. The company NOW offers a sports supplement that stimulates the natural production of growth hormone that may improve athletic performance. Pro-GH is a powder that contains natural ingredients, that may improve immune function, provide energy, and build muscle mass. You don’t have to be an athlete or body builder to use Pro-GH. It is used by people from all walks of life, customers who have tried Pro-GH claim that is gave them a huge boost of energy and helped them lose some unwanted fat! 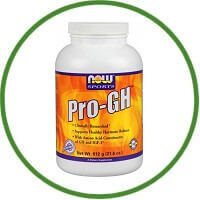 It is recommended by NOW that you take other supplements along with Pro-GH to enhance its performance abilities. Other NOW supplements suggested are NOW L-Citrulline, L-Norvaline and AAKG. There are no details on what these other supplements provide when taken in combination with Pro-GH! Pro-GH can be purchased from many on line retail sites, and NOW website provides a list of retail stores for your convenience. Pro-GH is not an expensive product, but there is no guarantee offered if you don’t get the results you want. The amino acids in the Pro-GH formula help replenish your body’s cells and stimulate the secretion of HGH, which provides energy and maintains youthfulness. L-Arginine 1.5g— improves circulation by expanding blood vessels, reduces high blood pressure, and may be beneficial in increasing muscle mass. L-Ornithine 1.5g —stimulates growth hormone production, which may help enhance metabolism. L-Lysine 500mg—is an essential amino acid, which is needed for the body’s production of hormones, enzymes, and collagen. L-Glycine 2g— helps increase muscle energy output, and has a calming effect on the brain. L-Glutamine 2g—enhances immune responses during physical stress and intense workouts. GABA (Gamma-Aminobutryic Acid) 500mg—used to reduce stress, tension and anxiety. Stevia Extract 75mg— improves insulin production and adds a natural sweet taste. Other ingredients include: fructose, citric acid, malic acid, natural flavours, natural beet powder, soy derivatives, DOES NOT CONTAIN: salt, yeast, wheat, gluten, milk, egg, shellfish, or preservatives. Does Pro-GH Have Side Effects? There shouldn’t be any side effects from taking Pro-GH because the ingredients in the formula are all natural, but it should be used as directed to ensure safety. Before taking Pro-GH, you should consult your physician and if you are pregnant or nursing you should not take Pro-GH.